where I did a tutorial on how to make it. 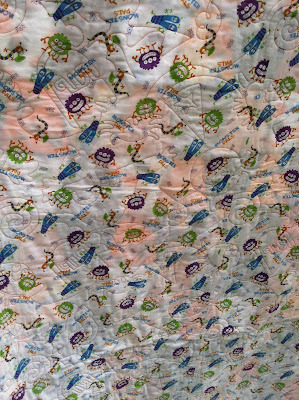 Funny story, I took this quilt with me on vacation to Petosky, MI and had to apply the binding. in a beautiful setting near Lake Michigan. It rained almost the entire time we were there and was incredibly windy. For the above photo I hopped out of the car, flung the quilt over the fence, quickly snapped 2 pictures and wadded the quilt back up and threw it in the trunk. I was frantically hoping one of the 2 pictures would be "the one". This is the one I used and I love how it came out. I quilted feathers in the snow portion. I'm not sure you can tell but I used light aqua thread. I quilted straight lines down the colored lines and out into the border. My LAQ, Liz did the circles in the colored border. If you know me you know that I have 5 cats, so everything has to be "cat approved". I think if Jack felt he could nap on it it must be good enough to stay! I love this photo as it looks like he is claiming it all for himself! A charm pack friendly quilt made using Marmalade. 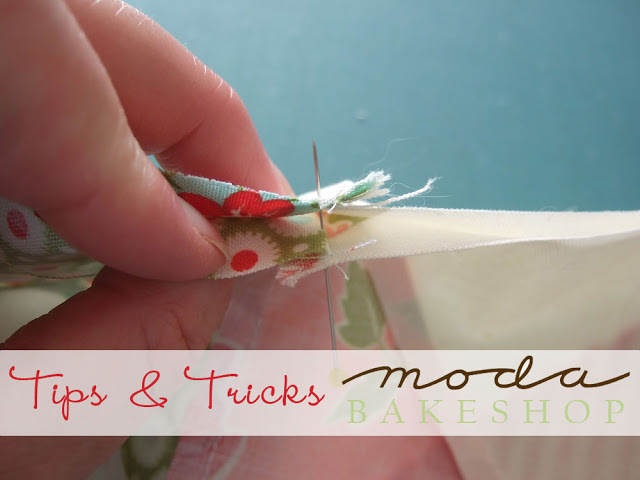 If you want to make one too, please check out my post on the Moda Bake Shop. If you stop over to the MBS, leave me a comment over there and let me know! Size is 56" X 68"
I LOVE Halloween and usually have a Halloween party. I didn't really feel like celebrating but thought I would do a post anyway. I have been working on a few things and of course I can't share just yet. I did take a few photos I can share however. First up is my cat Halloween, Hallie for short! She is king of the mountain! I was sitting in my sewing room, in the big green, comfy chair. Aiden LOVES it when I sit in this chair. in this photo you can see her actually giving my arm a big ole HUG!!! 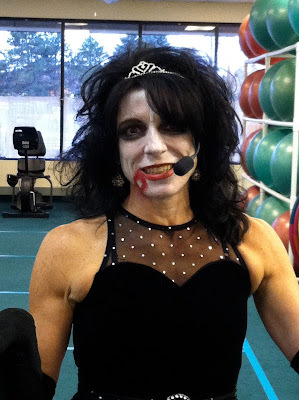 All week at the gym has been Halloween Zumba too. This is my instructor and friend the Zumba teacher, Marsha. Not to be left out of the "Happy Fall" theme is our silly dog! She came outside with me when I was taking photos of my son's Halloween quilt. I hope everyone enjoys a safe and candy filled Halloween!! I want to thank all of my great blogging friends for all of your kind words and stories and prayers. I'm sorry if I have not responded to each of them but I read them all. but I decided I wanted one more night. He slept in his usual place, with my arm around him with his purring us both to sleep. He got up in the night to potty and only made it just off the bed so I carried him in to the bathtub. On Sat he couldn't even get on to the couch by himself. You can see how peaceful he was here. It was the right thing to do but oh so difficult. My two BFF's Cori and Pauline tried to cheer me up on Friday night. Cori called saying that Pauline offered us to go over to her house and sew. I thought we should bake some cookies. Everyone feels better with warm cookies right? So Cori and I stopped by the store and got some pre formed cookies and baked them up. It's a Woopie pie pan and it is GREAT for making "deep dish" cookies!! These are some pretty special friends, I tell ya! 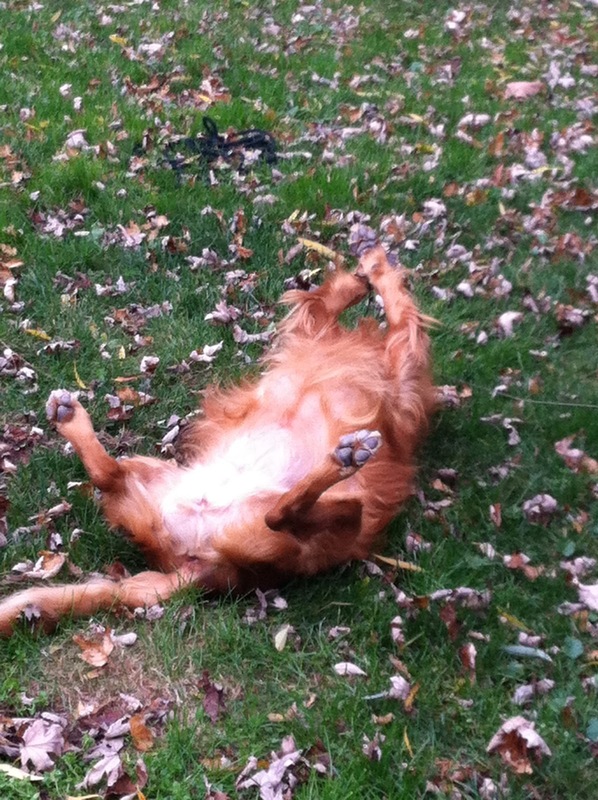 It was Cori's anniversary and she spent it with us. I can tell you right now I was NOT very good company. I guess your friends grieve with you. I am blessed to have you both as my friends. 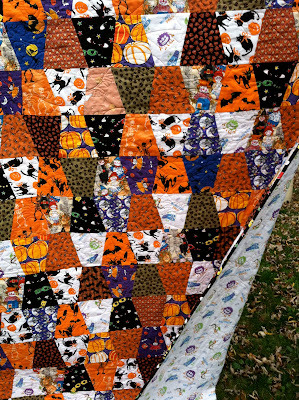 I did manage to finish the binding on my son's Halloween Quilt. This is the third one of these I have done and now have used up all my Halloween flannels! 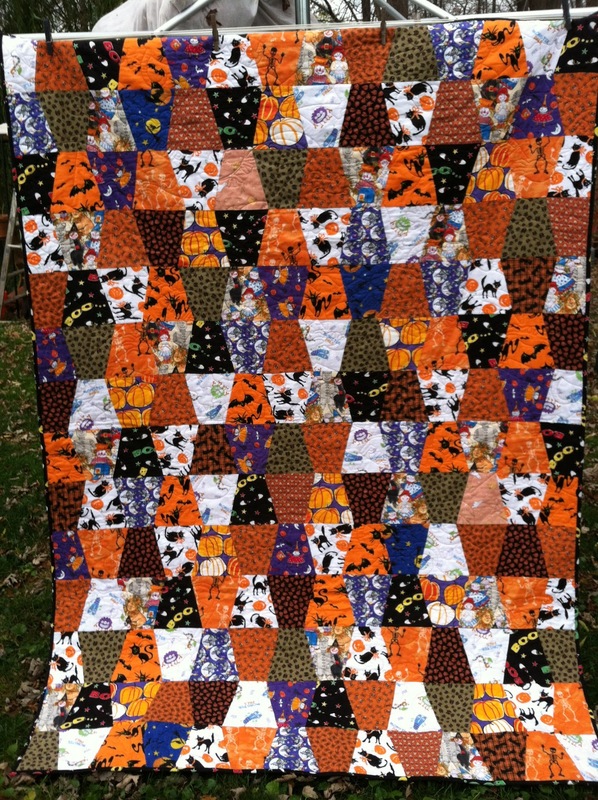 You can see the Halloween quilting on the back! I did bring the quilt inside and folded it up and went to get some paper towel to have with me for cleaning up my stamp. Little Miss Autumn all snuggled under the quilt! I just stamped it and wrote on it with her underneath! The four cats remaining at home rallied around me for the weekend, but it will just take time. I love you more than anything and will miss you forever! Please wait for me on the Rainbow bridge and please don't forget me!! I'm not my usual self right now. I completely forgot to share my nice surprise (so I guess it wasn't all death and dying this week). On Tuesday I clicked over to the MBS and imagine my surprise in finding this photo. There was a little write up about HST and how to make them. As a Bake Shop chef you are invited to write your post on their blog so they make you an author. This means you can write your post and save it as a draft but you can see other future posts. You can NOT open any that you are not the author of though. I did see that it had been labeled with my name but I didn't have any idea what it was all about. I assumed they were linking to my post on Charmalade, since it was all about HST. So when I went here I was heard to exclaim out loud, "Hey that my hand!!" I went over to my friend Robin's desk and told her to go to the Bake Shop and we squeeled together, "Hey, that's your/my hand!!" It was quite funny actually. I can't believe I forgot to tell you after I found out, but like I said I have been a little pre-occupied! If you would like some additional trips on HST you can check out my post here where there are some good tips and some additional photos. OK I think you are all caught up on my escapades for the minute. My life has been quite the roller coaster of late. I will say this up front, this post doesn't have much quilt stuff in it so if you are looking for that you will need to wait a day or so. Abbey relaxing by my Sparty bucket I bought. Ann Arbor Modern Quilt Guild meeting last night. Let me just say that at first it was a little intimidating. All three of us thought the same thing. I guess it's always hard to be new, right? and I will definitely be going back. I really want to get involved in this and it seems like a good group. I am working on a project that I thought might need some embelishments. I hope the person I am making this for LOVES it as much as I do!! OK now here we go. I really do need to talk. I know a family that just lost their 25 year old daughter to cancer. We have known this family for the last 18 years. The older daughter is the same age as mine, this was the middle daughter. One year older than my other daughter. They lost her 2 days before her 26th birthday. I am so sad for their family's loss. A blog friend has passed away recently too. She was only 47, also from cancer. This makes me think about my own mortality. 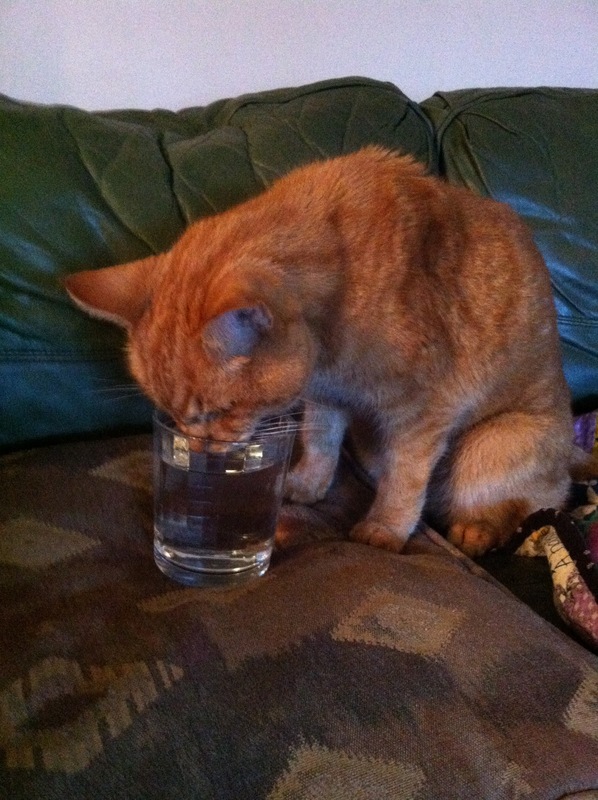 My cat, my FAVORITE cat, is in kidney failure, and he is rapidly declining. He has become so very thin and just this morning not acting like himself. I can barely think about it without bursting into tears. I am kind of an emotional wreck right now even if I don't show that to you. I am trying to focus on my own mental health at the moment. So please forgive me if I am not my usual self for a little while. 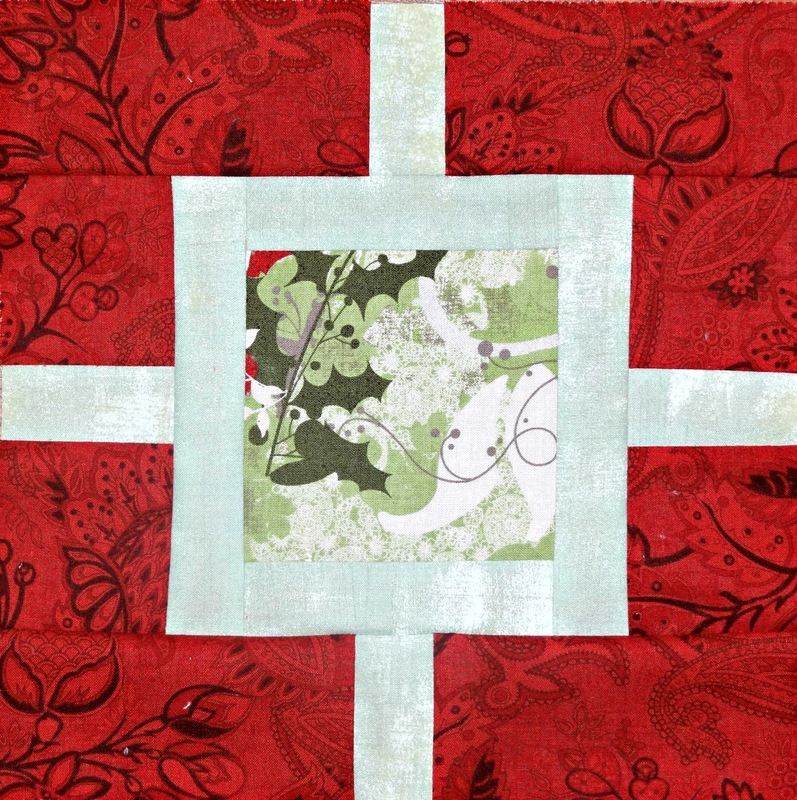 Quilting is only a part of my life, not my way of life. Lord knows I am just as insecure about my work as you are about yours!! LOL. you may not want to be too close anyway! Thanks for understanding and please keep Jack and me (as well as my dad) in your prayers. I am working on my productivity and hope to have the QAL quilt put into rows soon! How are you all coming along with yours? Tell me what you are working on, your success stories, friends, take me away!! I finally had some quality sewing time and got all 42 of my blocks made. How are you progressing with yours? I might have enough left overs to make an additional 7 blocks, for a total of 48!!! I would have to piece the outside colored part, but I was pretty sure I could do it. (you would only need 6 unless you are using Blitzen too. With Blitzen there is one fabric that matches the sashing so I didn't want to use it). I managed to get 6. Then I put my thinking cap on and you know what? Necessity really is the mother of invention! If I pieced all the little pieces, I could eek out one more block!!! Thank goodness I carefully cut off the selveges or I would not have been able to do it. Although this means I may need additional sashing, sigh, it's always something!! So here are my 48 blocks all stacked in color stacks. I did work on my Holiday Lane project too but I can't show that to you yet. I think you are going to LOVE it though. You will have to stop back later when I have my assigned day! How are you progressing on the Christmas Fence blocks? I hope to lay mine out so I can sew them together soon too. I was home from work yesterday. I met a good friend for lunch and then came home to work on my CF blocks. I managed to get 20 of the 42 blocks made so far. You already saw the first 2 but here are the other 18. I am totally loving the way these are coming out so far. Please excuse the poor photos, I took them this morning in the dark! We went to the apple orchard on Sunday and picked up a box of apples to make apple sauce with. Have you had time to get any blocks made? Mine was busy, as usual. I think I live in busytown! I did manage to get a few blocks finished for the QAL. I want you all to be able to begin sewing too. 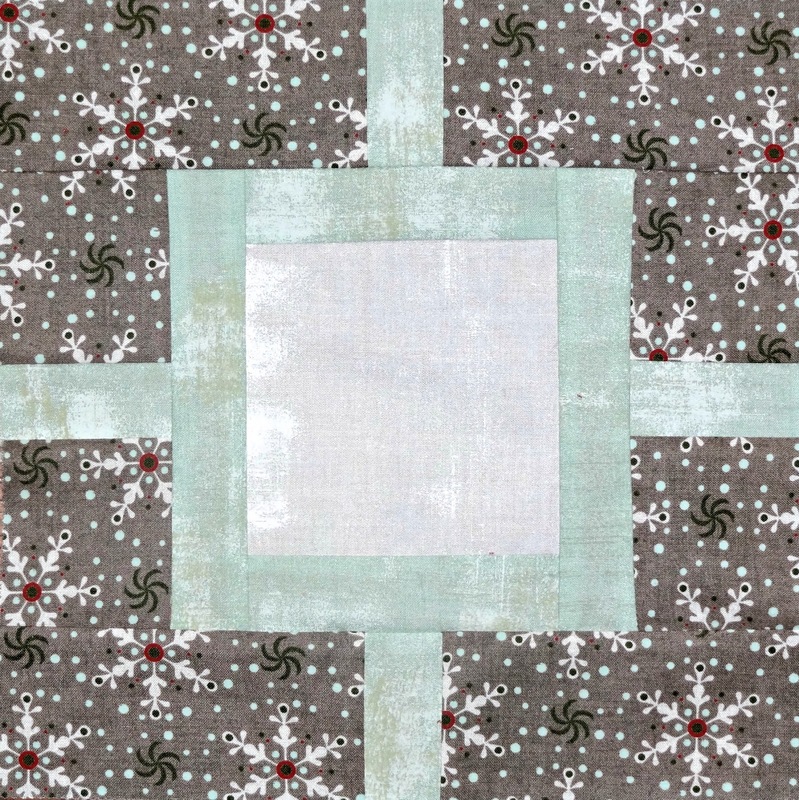 The pattern we are following is from Cindy at Hyacinth Quilt Designs. She called it Garden Fence. Thank you Cindy for allowing us to use your pattern! 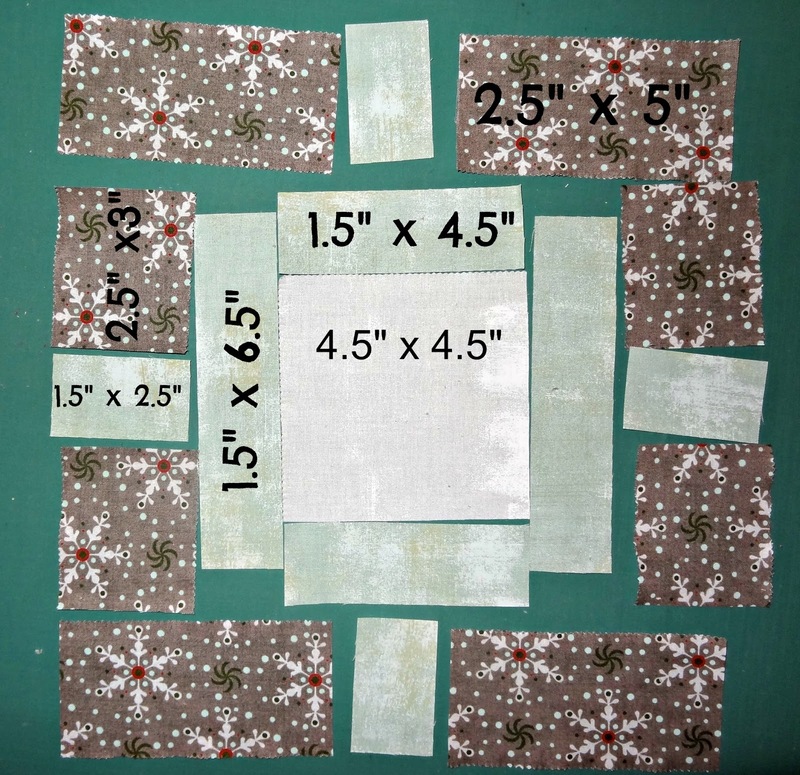 I am calling ours Christmas Fence since we are using Christmas fabric for our quilt. to make yours like I am making mine. using left overs from each of the jelly roll sections. If you are using a JR you will have to do the same. There are only 40 strips in a JR, so we will have a couple of multi color blocks. I'm kind of excited about those blocks! That's what we quilters do though, right? I will show you what I mean when I get there. 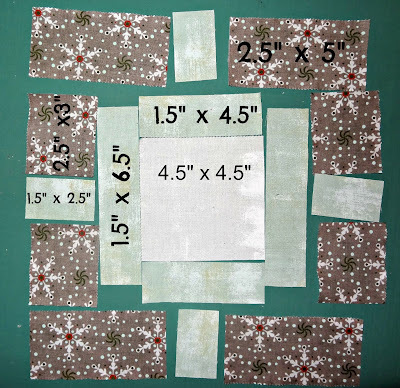 Using your charm pack you will cut all the charms to 4.5" x 4.5 "
From one Jelly Roll Strip you will cut 4 pieces 2.5" x 3" and 4 pieces 2.5" x 5"
4 pieces 1.5" x 2.5"
2 pieces 1.5" x 4.5"
2 pieces 1.5" x 6.5 "
I cut 32 1.5" x WOF strips and was able to get all 42 blocks worth of sashing from that. I cut several different ways to maximize the number I got out of the strips so I could cut as few strips with as little waste as possible. You may need to cut a few more strips than I did, just play around with this. For the sashing between blocks you will need to cut 35 1.5" x 10.5 inch strips. Those will go in between the blocks to form a row. 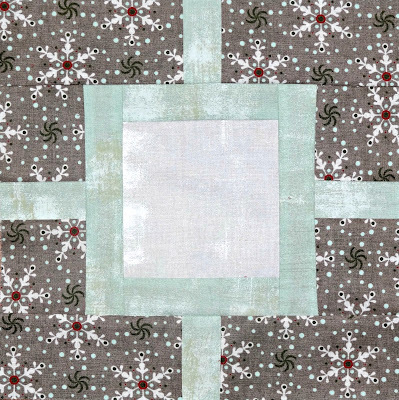 There will also be 1.5" strips between the rows and then around the center of the quilt. I am not going to talk much about that here and now as none of us are actually at that point yet. I like to have the rows made so I can measure and then cut. If you want to play along just leave me a comment telling me you are going to join in. so please put your photos there to share with and inspire others! Please take the button on the side bar and put it on your blog if you are participating. I would appreciate you using the button so you can spread the word! 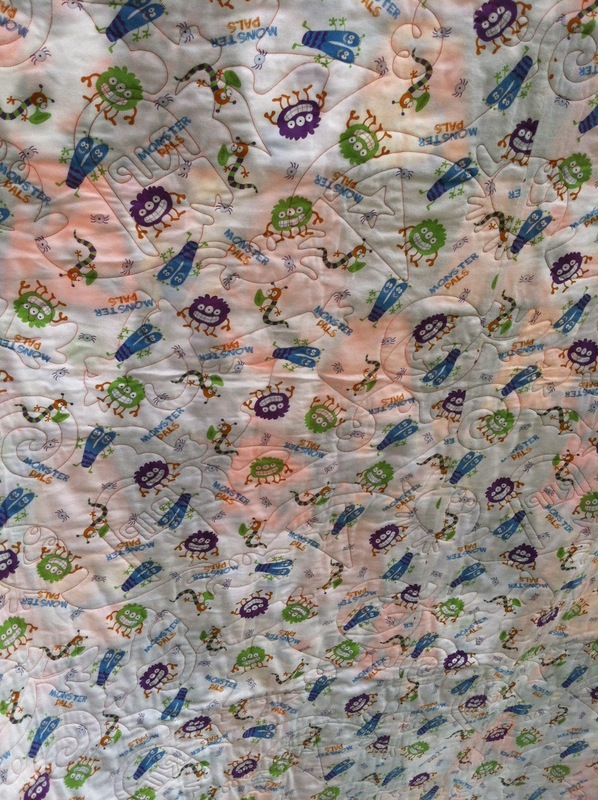 I can't wait to see all the quilts spring up out there. Oh, and one more thing, hop over to Cindy's and thank her for such a beautiful pattern and for her allowing us to use it in our QAL! My Daughter Bought A House!